The application for these movements is a simple one that should be recognisable to most people. The kata implementation of the method is, I'd have to say, klunky. I don't even know if this has a name, it's too simple for judo. Tai-Otoshi is probably closest. Bouncer's throw? Yank your arm down to the left to unbalance him and move you off line. Step forward and reach over his back with your left hand, trying to get hold of his collar, but a shoulder will do. Pull with the hikite towards your left hip. Step forward with the final 'oi-tsuki' and get hold of his belt if he has one, or just clothing round the waist sort of level. At this point he should be bent over, you should have his collar or there abouts in your left hand and his belt or there abouts in your right. 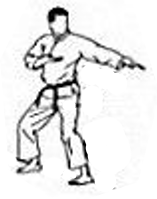 Rotate 225° anti-clockwise while dropping into shiko-dachi and "toss" the opponent to the floor, he should "trip over" your back leg.